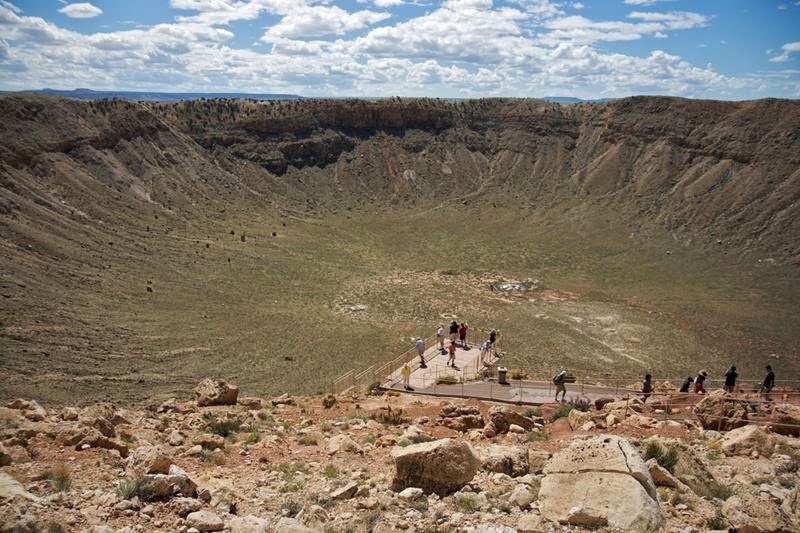 Formed after the fall of the meteorite crater Meteor or Barringer, is located about 69 kilometers east of the city of Flagstaff and near the town of Winslow, located in the northern Arizona desert, USA. 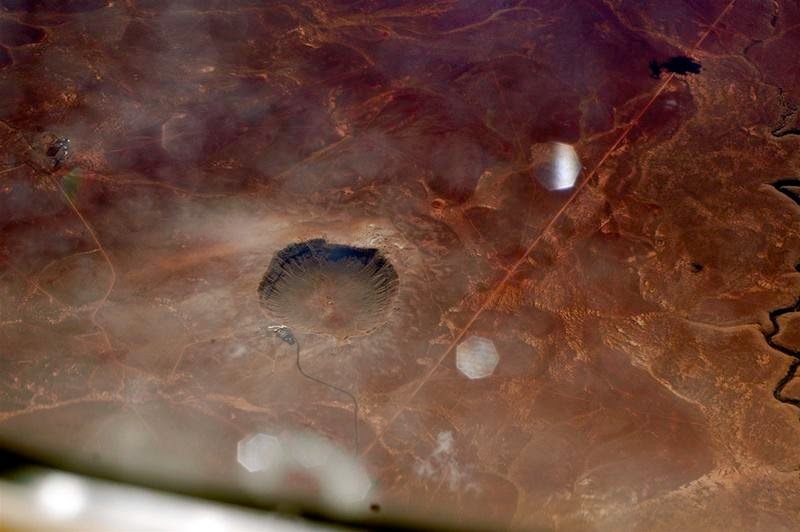 Barringer Crater, or as it is called - Meteor Crater, originated about 50,000 years ago in a fall on the Earth meteorite vesivshego 300,000 tons and flying at a speed of about 45-60 thousand km / h According to calculations, the explosion at the fall of the meteorite was three times more powerful than the Tunguska explosion, which can be compared with a thousand Hiroshimas. 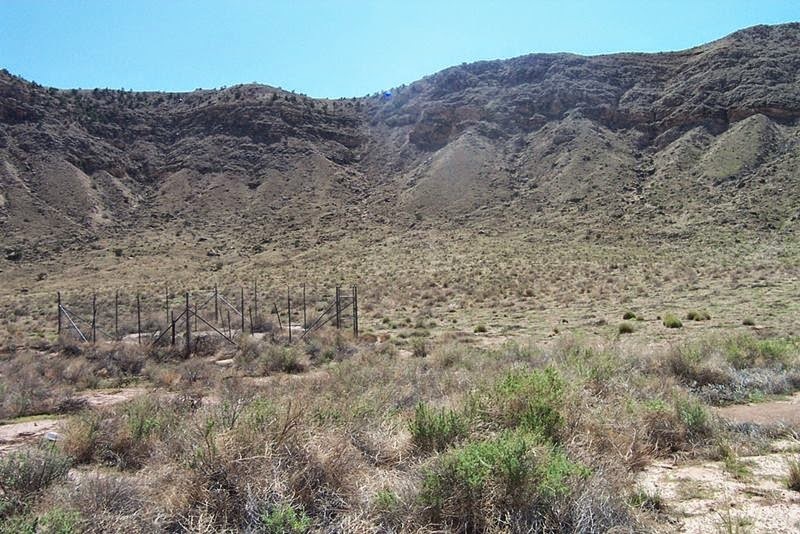 In the district of Arizona crater were found fragments of nickel-iron meteorite. Some meteorites, such as the Tunguska meteorite, have left behind a crater. 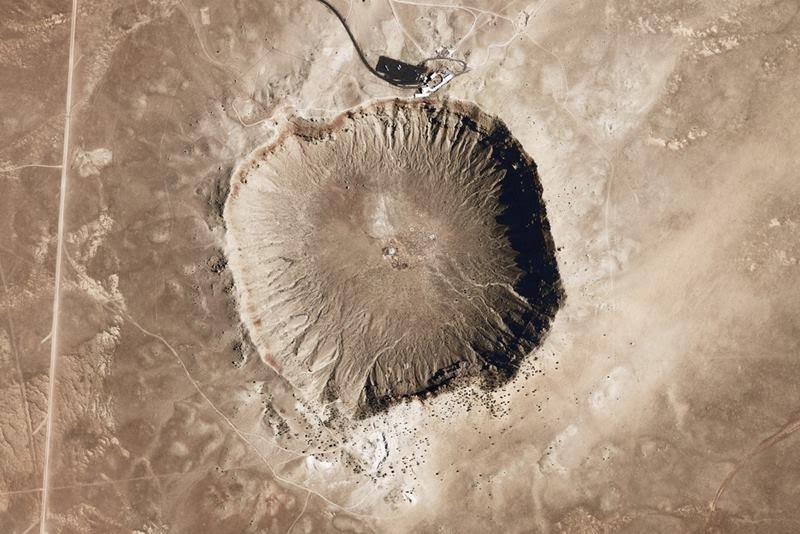 Whereas Berringer Crater perfectly preserved and has a shape similar to lunar craters. It is a huge cavity width of 1200 meters and a depth of 200 meters. In Arizona crater trained astronauts who had to go to the moon. 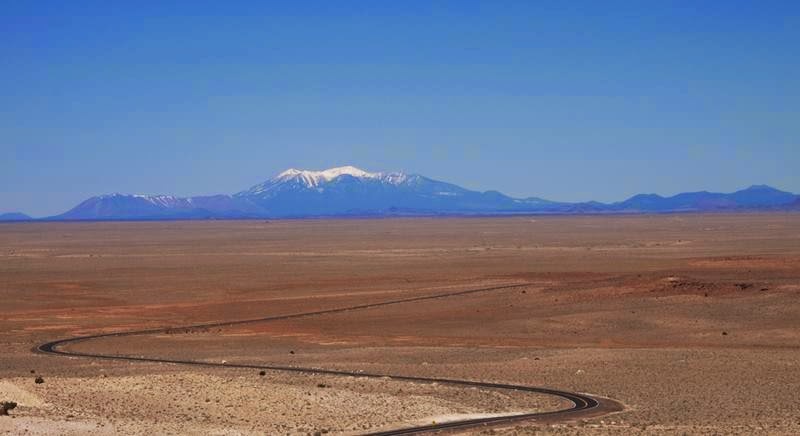 The local landscape is considered to be the most similar to the moon. Locals often talk about the appearance of UFOs in these places. 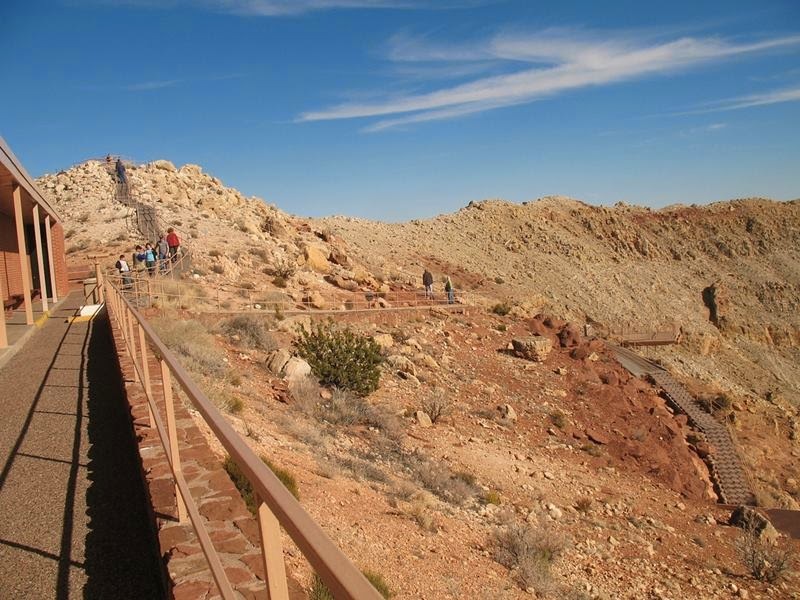 Berrenzhera crater is one of the most popular attractions of Arizona. 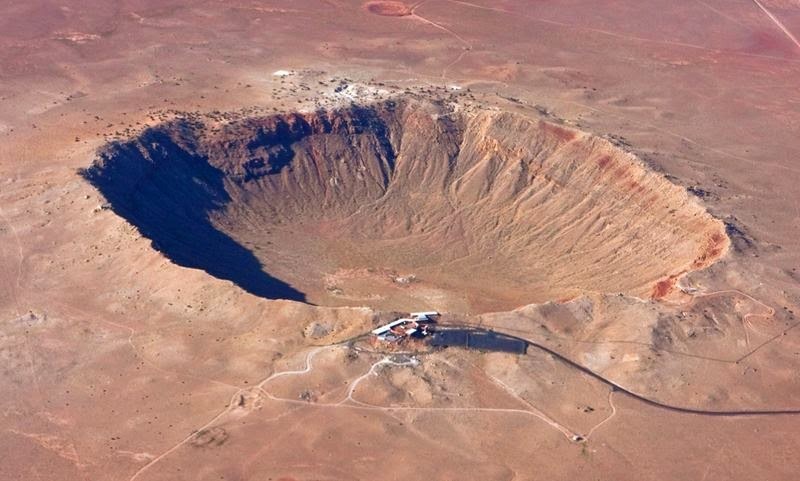 This is not the largest meteorite that fell to Earth. In the Antarctic, on the island of Wilkes in 1962 discovered a meteor crater 241 km and a depth of 800 m in Canada on the coast of Hudson Bay has a crater with a diameter of 443 km. Meteors rarely fall to the ground, but a few cases still recorded. In 1908 over Tunguska taiga, about 10 km. from the surface of the Earth, the explosion occurred. Its sound was heard nearly 1,000 km, and the trees knocked down on an area of about 2000 square kilometers This colossal explosion could have been caused by an asteroid or comet fragment. Some scholars suggest that this meteorite caused mass death of the dinosaurs that occurred 65 million years ago. According to this theory, a huge piece of space pierced the Earth's atmosphere and reaching the surface, leave a crater depth of 50 km, 200 km in diameter, on the seafloor. Volcanic products and hot gases joined millions of tons of dust and rocks thrown into the air. Dust rose into the upper atmosphere and blocked the way of the life-giving solar energy, causing impaired development of the plant and reduce the amount of food that has caused the death of many animals, including dinosaurs. A large crater, recently found off the coast of Mexico, maybe confirm this theory. 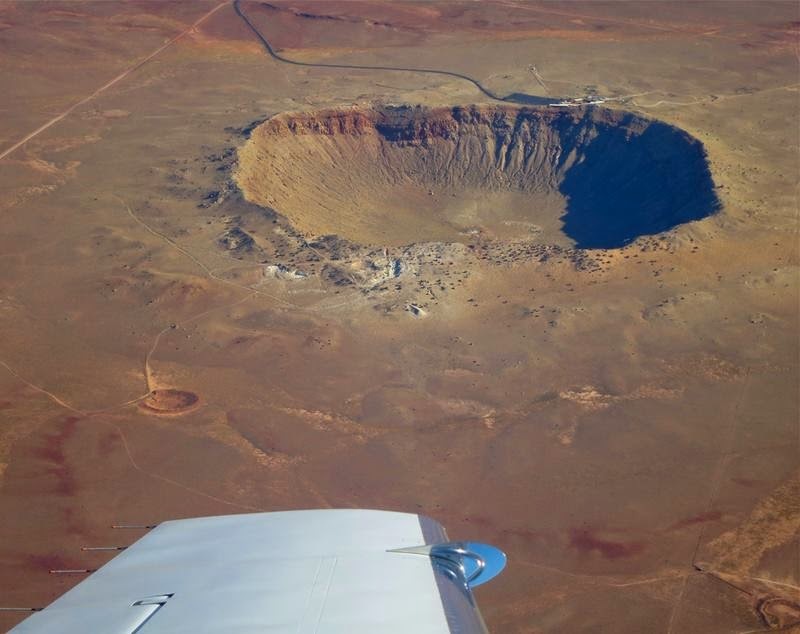 Currently Arizona meteorite crater is a popular tourist destination, privately owned family Barringer. On the northern edge of the meteorite crater is a visitor center, which presents interactive exhibits, and where everyone talk about meteorites, asteroids, space, solar system and comets. 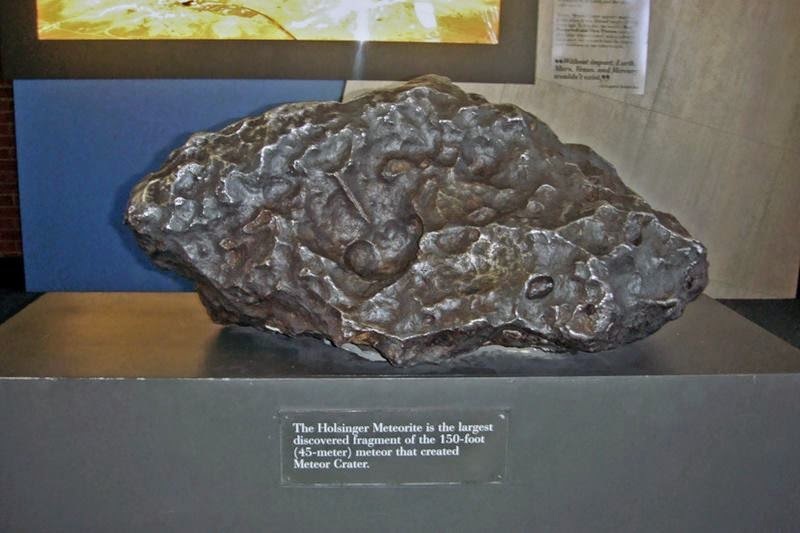 We can see the 637 pound meteorite found in the area, as well as fragments of the meteorite crater found in Arizona, they can even touch it. Visitor Center, formerly known as the Museum astrogeology includes theater, gift shop and observation point overlooking the inner edge of the crater, with daily excursions.